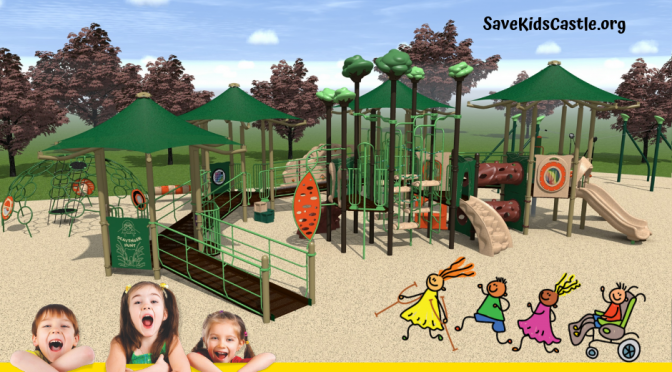 The Kids Castle playground is temporarily close from Monday, April 8, 2019 through late-June 2019 to install new play structures usable by children of all abilities including kids with special needs. The Park itself will remain open during the entire project. This temporary closure of Kids Castle marks another step in the ongoing “Build the Kingdom” campaign, aimed at achieving inclusive play at the playground for children of all abilities including those of special needs. In addition to these inclusive play upgrades, the temporary closure will also allow for improvements of the existing playground, including the installation of a new, more durable safety surfacing called Poured-in-Place (PIP). This PIP surfacing will also provide equal access to the playground for all and ease in maneuverability for people using wheelchairs and other mobility devices. The Kids Castle playground will remain closed from April 8th, 2019 through early to late-June 2019 until these upgrades are completed. The ongoing “Build the Kingdom” Capital Campaign Project would not be possible without the generous ongoing support of volunteers, donors, the Township, and the entire community. Volunteers are still actively fundraising for additional upgrades for Kids Castle that are needed for children of all abilities. Please go to the Donate Your Way Now section of our website to donate in any amount you can afford. More updates on this Phase of the Build The Kingdom protect coming soon!